Test your dexterity and driving skills in this energetic game with Four different Cups, Four unique R/C Cars, and 15 beautiful tracks to race on! 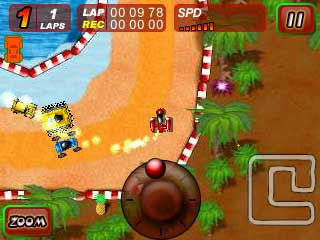 This simple, yet entertaining game combines traditional arcade racing games with unique mini R/C car-like controls and zany cartoon graphics resulting in an exciting, easy-to-play racing experience! Wild Gears features beautiful cartoon graphics, intuitive controls, a rockin' soundtrack, and most of all, fun! Four different Cars to choose from, each with their own strengths and weaknesses! 15 awesome tracks to race on, from the beach, to the snow, inside of castles, ruins, and even lava! Four different Cups to compete in! Auto-save automatically saves your progress when you exit, so you can continue where you've left off! StarPop® can be simply described as fun, absorbing, stress busting, and even poptastic! If you enjoy popping bubblewrap (and who doesn't?) then you'll love StarPop®. Pop stars, burst balloons, splat fruit and a whole lot more against all kinds of cartoon backgrounds. Trigger the popping bonuses for extra points and unlock special onscreen prizes. Simple to play - just pop stuff! Having played the Java version of Mummy Maze more times than I wish to acknowledge, I was very excited to see a port of it available for the Palm and Pocket PC PDAs by Astraware. The premise of the game is very simple: guide your explorer to the exit before the mummy can reach you. The challenge lies in the fact that your character can move only one space a turn, but the mummy can move two. This means in most cases a dash for the exit is not the best solution. In order to escape from the maze, you must use one flaw that the Mummy has. The Mummy always tries to get closer to you horizontally first, vertically second. Using this nature against him and tricking him into the traps created by the walls in the maze is the only way for you to survive and get out the maze alive. 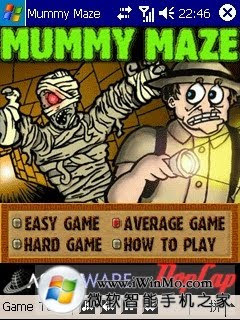 Mummy Maze offers 3 levels of difficulty, and 15 chambers in each level. The difficulty setting affects the size and complexity of the maze, but does not make the mummy itself any more or less powerful. You can control the game either using the hardware buttons or stylus. The graphics in Mummy Maze are about what we’ve come to expect from Astraware. Everything from the menus to the characters is clean and well designed. The levels themselves are displayed from a top-down viewpoint with strong 3D textures. The cartoon pictures used in the opening and game over screens don’t really fit the rest of the graphics, but it doesn’t detract from the game in any way, and is easily overlooked. The sound effects are very simple, which fits the gameplay. You will hear the footsteps when you move and miserable body slamming sound when Mummy crushes you. I wouldn’t mind a mummy groaning noise or my explorer screaming like a little girl when he gets captured, but perhaps that’s just my sadistic side. Music is a fast pace adventure music style. Both sound FX and Music volumes can be adjusted or turned off completely. Overall the game is solid, well designed, and more addictive than I would like to admit. Once you get the hang of it, you will want to keep coming back to stare at the maze that's challenging you. If you are the type of a person who wants to get a solution right away, you will either get very good at this game or you will give up early on at the game. The only other issue I had was that the info icon on the alert box was discolored for some reason, but all in all, this is a very well done title. Running Voice GSM is the most complete and user friendly GSM/GPRS Communicator for the Pocket PC platform, providing the PPC device with a platform for GSM,SMS,advanced data capabilities. IMPORTANT Running Voice GSM 3.x only supports Windows Mobile 2005/2003 based devices! 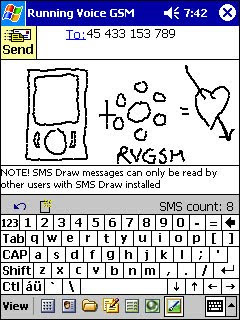 SMS Draw is a free add-on utility that enables users of Running Voice GSM or the SMS Manager to easily draw and send pictures to others having SMS Draw installed. SMS Draw involves no data modem connection since it is based on the SMS format. SMS Draw integrates into the target application and appears as a new service in the toolbar. SMS Draw provides both an editor as well as a viewer for drawings. The SMS Draw utility also provides full history of sent and received drawings. - Application is available in English and German. - Three difficulty levels (Normal, Expert and Executioner). - Word Lists are available in English and German. - User written word lists. - WLC (Word List Compiler). User written word lists and WLC can be found here. WLC is a Word List Compiler which enables you to create your own word lists (.wl files). PocketVoc is a vocabulary trainer which makes it possible to learn more than only vocabularies. You may also learn countries and their capitals, foreign words, etc. Turing a training PocketVoc remembers each of your answers and asks you the words which are more difficult for you. You can setup how often a word must be answered, how many seconds you have to answer a word etc. Thanks to those genius geneticists, it is now a commonly known fact we share 98.6 per cent of our DNA with chimps. What remains a mystery at this point however is exactly what the remaining 1.4 per cent actually governs. Clearly a propensity for extra hair growth, the ability to grip objects with one's toes and a fundamental failure to appreciate the need to get up at 8am, drive to work and spend the majority of the day toiling in misery would all seem to be candidates. DutchTab is a Windows Mobile application that lets you quickly and easily split bills between friends or coworkers. It automatically calculates who owes whom based on the ratio of each person’s order and their contribution when the bill was paid. You can even send everybody a summary by email from your device. Windows Mobile Pocket PC 5 , 6 , 6.
iContact is an all-inclusive finger-friendly contact manager for Windows Mobile PocketPC phones. It's easily skinnable, intuitive, and replaces the standard Windows Mobile contact chooser. Translations are available for over 25 languages. iContact supports true VGA skins but also will support any screen size! The default skin has a diamond-like look and feel; other skins are available on the skins page. iContact settings can be found in the Windows Mobile system settings menu. The app is very easy to use, it only lists contacts in scrollable list. Use it for accessing your contacts by scrolling the list with fingers, similar to iPhone. Just tap, drag and release. SportyPal is an easy to use intuitive application for your mobile phone. You activate it when you start your running, cycling, walking, rollerblading or similar exercise. In two simple clicks it will start to log and map your position, movement, distance, tempo and calories burned. It will not affect normal operation of your mobile phone, so you can still listen to music, receive and initiate calls and messages. 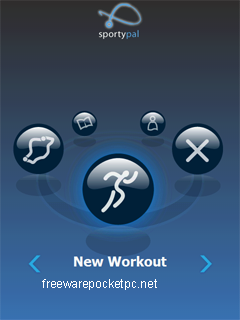 When you finish exercising, the collected performance information will be stored on your mobile. Later you can review it, compare it with other exercises or check your best performance achievements. SportyPal will present each exercise in a map view, draw elegant graphics charts of your performance or present summarized information. SportyPal is intuitively designed to assist you improve your performance in running, cycling, blading, walking, skiing or other workouts involving similar activities. The real brilliance of SportyPal comes with the web integration. You have a possibility to upload your workouts on the internet with a simple click of a button on your mobile phone. Registering to SportyPal web application will enable you to have instant access to your workouts performance and maps from anywhere. The web application provides additional functionality for analysis of your fitness workouts. You can also share your exercises with your friends, comment on their performance or organize virtual competitions. 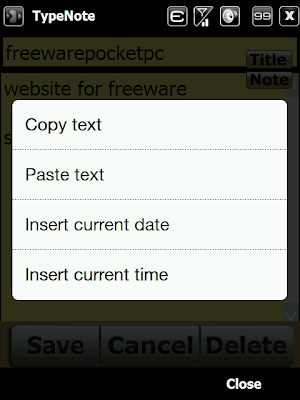 You can quickly view or copy in the clipboard the username, email or password, to paste it into another application running on your mobile device, or type in that information when using public computers or someone else's machine. 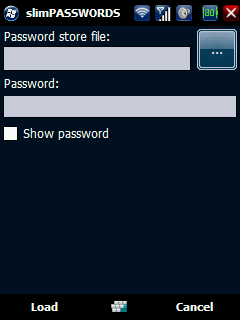 You can even open the associated URL while copying the password in the clipboard. You will need all your wits about you to solve the intricate puzzles in this captivating new cube-matching brainteaser! Beautiful graphics and animation please the eye, while the in-game music delights the ear! Faithfully converted from the highly-popular online game from Freshgames, Cubis is a beautifully crafted block-sliding puzzler. Cubis features two modes of play: Puzzle and Arcade, with 100 hand-designed levels. Slide the blocks to match the colours and clear the required number of cubes before time runs out. Cubis features 3D isometric graphics with a choice of background themes, and is enhanced with an atmospheric soundtrack. One hundred ingenious hand-designed levels! Revolutionary new 3D isometric graphics! Three gorgeously detailed background schemes - 'Mayan', 'Leonardo' and 'Chinese'! Comprehensive ten-level tutorial to introduce you to all aspects of the game! Extraordinarily accurate conversion of the online game by Freshgames LLC! Join Commander Steele of the Galactic Exploration Alliance in a dramatic story of war and technology where the very future of mankind is at stake. 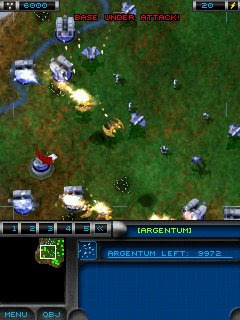 Coming only to PocketPC, Argentum aims to set a new standard for PocketPC gaming. 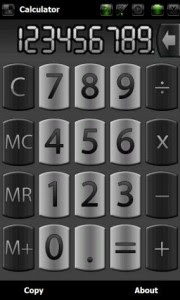 The standard HTC calculator is boring, which is why MarDor created a skin for it. It sort of has a metallic look to it and has support for landscape view as well(scientific calc). There are two versions, 1.0 and 1.1. 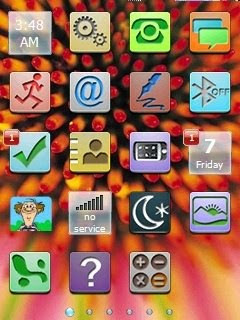 Download the version that coincides with your current version of HTC calc or it will have glitches. - If you don’t like it just uninstall the cab and give your device a soft reset. 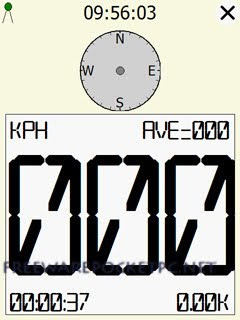 hdSpeedo is a simple GPS speedometer for your Windows Mobile device. It will be usable for you if you have broken speedometer or can't see the actual one, if you are traveling by bus or any other vehicle. The developer said it is tested on a HTC Touch HD and Diamond, but should work on any WM device with a GPS receiver. PDAMill Arvale Journey of Illusion - Arvale: Journey of Illusion is an epic Role Playing Game, with over 20 hours of gameplay, six immense continents with 280 maps to explore, 200 different monsters to fight against, and over a hundred different items, weapons, and magic spells to use. The current version is compatible with all current Pocket PCs and we're working on Palm OS and MS Smartphone vesions, which will be available later this year. Interact with tons of objects from treasure-filled chests and mysterious doors, to antique books and creepy coffins. Enjoy over 100 sound effects that accentuate battle hits and give ambiance to the environments. Keep track of your food intake and workouts, graph your protein/carbohydrate/fat percentages, calculate your metabolic rate, lose weight, and get in shape. Mobile Coach has a powerful built in food database of over 3,000 foods. Windows desktop companion software is free and synchronizes with your Windows Mobile device. New! - Powerful new food database is faster, easier to search, and requires less memory on your device. Save frequent foods as Favorites or Meals for quick and easy data entry. New! - Synchronize your changes with the included desktop version (for Windows XP or Vista). New! - Customize the 17 different measurements to record anything from weight, body fat, blood pressure, blood sugar, or whatever else you'd like! Use graphs and reports to track your progress. Calculate your estimated metabolic rate. See a chart showing your percentage of protein, carbohydrate, and fat intake. Includes calorie burn rates for over 45 different activities. 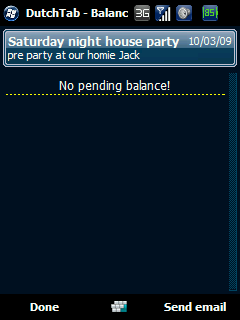 Add in your own activities if you'd like. Calculates pace and speed for distance activities like running, biking, or swimming. Now you can get more from your eBooks on your Windows Mobile device. * Remarkable content support and unmatched portability: Enjoy thousands of Owner Exclusive eBooks on Windows Mobile — and take your eReading library with you wherever you go. 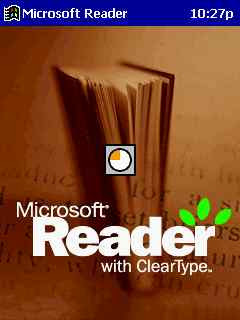 With Microsoft Reader for Windows Mobile you can easily copy books from your desktop/laptop/Tablet PC to your Windows Mobile and continue reading wherever you are! * Great on-screen readability: ClearType® display technology that makes text on screen crisper and easier to read than ever before. The adjustable font size setting makes it easy to customize your reading experience. * Dynamic reading: features include highlighting, bookmarking, note taking, and drawing. Plus, you can view your annotations and rename or erase any of them at any time. Pippolia has created a nifty tool, iCalendarFactory, that adds the games of your favourite sports teams directly to your calendar. After installing, run the program and select your favourite sport and team. This will downloaded your team’s schedule for the next month and add it to your calendar automatically! Sports: Futbol/soccer, NBA, MLB, NHL, NFL, College Football. Winterface is the Next Generation Shell for Windows Mobile comprising the options of a launcher, a task manager, and multitude of Today plug-ins. Winterface virtually replaces default interface of touch screen Windows Mobile devices and gives the user unprecedented freedom to easily lay out interface exactly the way they like it. 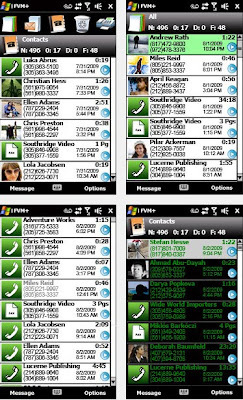 Fusion Voicemail Plus 2.0, a free, downloadable visual voicemail application by PhoneFusion, gives Windows Mobile phone users with wireless data and text messaging plans the ability to centralize all of their voicemail boxes and see—right on the device screen—a list of their voicemail messages. It also allows users to listen to voicemails directly from their phone. A new feature—exclusive to Windows Mobile users—is that for the first time mobile consumers can receive faxes right on their smartphone. Users can use their existing mobile number or register a new number to receive faxes. Another feature developed exclusively for Windows Mobile users is the ability to easily forward voicemails to any e-mail address or another Fusion Voicemail Plus mailbox. Fusion Voicemail Plus 2.0 also integrates with the user’s address book and expands the ability to use touch screen gestures to navigate through messages. The ability to synchronize multiple voicemail boxes to one location. The ability to view and listen to voicemails right from your phone. The ability to send SMS (text) messages to the person who left you the voicemail. Send the message directly from the Forward voicemails application to other users on the system or through e-mail. True Caller ID Delivery on each voicemail. If the caller is not in your phonebook, Fusion Voicemail displays the information from the phone company as the caller ID. Midomi is the ultimate music search tool because it is powered by your voice. Sing, hum, or whistle to instantly find your favorite music and connect with a community that shares your musical interests. 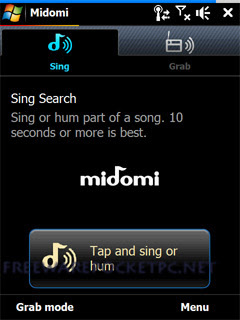 Midomi is a Windows Mobile app, which lets you hum or play a song to get the song’s title and artist name. myPlayer is a stand-alone, light-weight application that accesses the BBC iPlayer, ITV Player, Hulu and Five On Demand services directly - eliminating the requirement for a (flash-enabled) mobile browser. SciLor's Driving Licence Trainer is a little program for doing theory driving licence training. You can easily write your own question files by take a look at the existing one and make your own database(sdf). 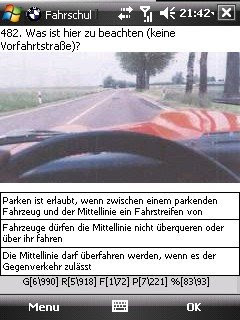 A Question Pack for the German Driving Class B is already included (2009)! TypeNote is a simple application for taking notes. - all notes saved as separate text files in its categories folder. - Scans TypeNote\Notes\ or user specified location for folders that contain .txt files. * When browsing, press the folder name to list all music files under that folder, including subfolders; or press the arrow button to list the subfolders. * Press any one of the filename to play. * To go back to the music file list, press the top left back button. * To view the current album list, press the top right icon. Then press any one on the list to play that music. * To go back to the single music view, press the top right icon again. * On the single music view, tap the screen to call up the timeline. Press the left repeat icon to repeat the current playing album; press the right shuffle icon to play the whole music list randomly. When both icons are on, only the current album will be played randomly. * Under the music playback screen, slide up or down the edge of the album art will change to the Album View screen. To go back to the normal playback screen, slide up or down the edge of the album art. 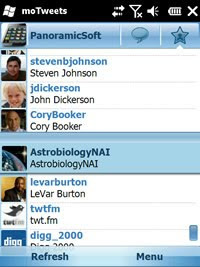 moTweets allows you to take the people you follow on the go. Upload photos from your device camera and post their location for your followers to see. SciLor's Fahrplanauskunft is a tool for searching timetables for bus and trains in germany over VRR.de and Deutsche Bahn. You can save those plans and take a look on them offline. SciLor's Fuel Blaster is a tracking tool for creating stats about consumption, distances and prices about your fuel. It also features of stat-prediction and graphs. It has got a "touch-friendly" interface so you are able to use it without your stylus. - Double-Click on an existing item to be asked for deleting it. - If you are updating from 0.5 Beta please backup your database (FuelData.sdf). Otherwise it will be lost! - If you are updating from 0.6 please backup your config.cfg. Otherwise it will be lost! SiDiary 6 enables you to easily track all your relevant diabetes data. This way you can optimize the quality of the medical treatment in co-operation with your doctor. Especially in our new version SiDiary 6 we have integrated many new tools, so even untrained computer users will find SiDiary 6 easy to handle. - profile wizard: asks you simple questions on your therapy and finds an optimal way to configure the software for you - the software is helpful for all types of diabetes (type 1- diabetes, type 2-diabetes, MODY, LADA, pregnancy diabetes etc. 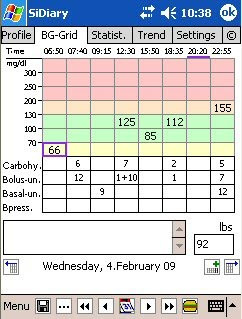 ), even useful without any medication - useful for all kinds of therapy (basis therapy, CT, ICT, CSII/pump) - imports data from all blood glucose meters, insulin pumps and blood pressure meters - you can define your own parameters to track anything you can imagine - you can mark your entries with events so you can use it as a filter in the statistical analysis - you can use the software easily on PC, Pocket PC, Smartphone, Java cell phone, iPhone/iPodTouch, mobile internet and import data from all external devices to your PC - sends automatically short messages from your mobile phones in case a measurement is out of the target range - you can analyze your data with statistics and trend functions even on your mobile devices - direct feedback and therefore great motivation enhancement - contains editable food database - Send your data through email (encrypted and password protected) to your doctor - Many Import-, Export- and printing functions with editable templates - Online platform - available at https://diabetes.sinovo.net - is suitable for use on mobile devices like iPhone, Blackberry, Android Please note that SiDiary is not a replacement for a real doctor! GPS Enabled Weather Radar is weather application that uses your built-in GPS to pull radar images from 3rd party weather services. You can view imaging in satellite or radar formats. It’s currently supported for North America, but it might be possible to add other locations with radar sites. After running the application, it will turn ON your phone's GPS and log your current coordinates in a csv file. 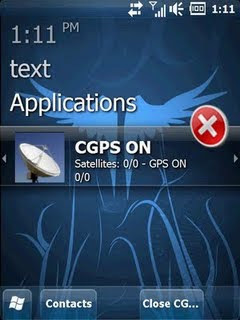 If it is able to get a valid coordinate, it will turn your GPS OFF and then wait for 5 minutes before turning it ON again. - will allow you to send an sms to one of your contacts with your last logged GPS coordinate and also a link to open Google Maps (installation is required on the receiving phone) and point your location. MyNote is just released note taking application for Windows Phones developed by folks at MyLostBlog. 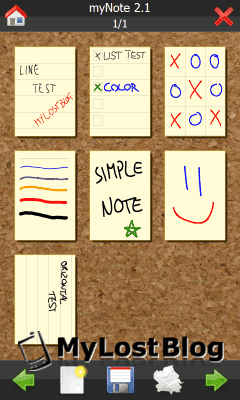 It has thumbnail preview function of your notes. You have options to change the size of the brush you want to use, its color, etc. 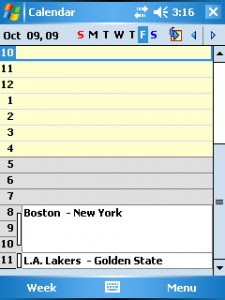 Also available are options to draw tables, or separate the plot into columns or rows. 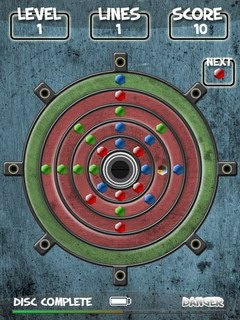 Melonchi Minecarts is our brand new high quality Arcade Puzzle game for Windows Mobile Pocket PC devices. Journey back to Arvale to solve the mysteries of the Melonchi Mines with your favorite characters: Duncan, John DeMenchev, and Grwyth the Dwarf. Enjoy a unique and extremely addicting puzzle game including Gems, Minecarts, and Exploding Tracks while enjoying the visuals and ambience of the Arvale world! from the same wacky writers of the Arvale series. 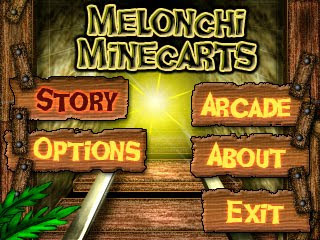 Melonchi MineCarts is intuitively designed to be enjoyable for anyone to pick up and play. Beginners and die-hard puzzle fans alike will be riding Minecarts in no time! intuitive controls, and of course, Melonchi, Gems, and Arvale! High Quality Music and Sound Effects add to the ambiance of the Melonchi Mines... and beyond! 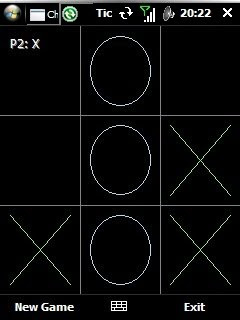 SciLor's Chameleon TicTacToe is a completely Skinable TicTacToe Game (ALPHA STATE! NOT FOR DAILY USE! GUI IS JUST FOR TESTING). It includes three AI's Easy, Normal, Hard. - Finger-oriented interface which brings the comfort into messaging so that you may use it on the run. - PIGEON! shows ultimate performance even on the devices with modest configuration. - Supports downloadable resources such as color schemes and downloadable smiley packs. - Is translated into English, Russian, German, Czech and Chinese so that you may use it in your native language. - You may use multiple accounts simultaneously. Nektra Contact Manager is just released contact manager application. 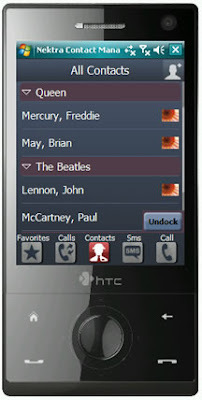 It has finger friendly interface which perfectly fits the need of managing huge number of contacts with few touches. Interface Monitor is a program for Windows Mobile phones, which visualises your network traffic and graphically displays a chart. You can view your Internet traffic over WiFi, GPRS and USB and the programs allows recording. 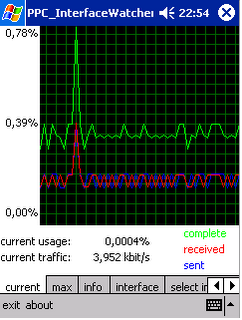 The graphs shows sent, received, and the total traffic. Detailed information such as current / maximum traffic, current bandwidth utilization is available too. Auto Light lets you customize the different levels of brightness according the the environment. You just need to choose the brightness level (from 1 to 10) and set the limits of the sensor to the change the level. It is supposed to be better auto adjuster of the backlight for your phone. Run AutoLight.cab and install in main memory (not in storage card), run AutoLight.Config.cab and install where you like, then softreset (this should also disable the native auto adjust backlight function, check for that in the Control Panel Power applet). If you have previously installed autolight V2.x and want only upgrade to V2.3 without having your configuration reset to default use the Configurator to stop AutoLight. After that overwrite AutoLight.exe, ChangeLight.exe and AutoLightConfig.exe with the files you find inside AutoLight.zip and softreset. The Configurator gives a more user friendly access to these parameters. Nevertheless, the configuration process is quite complex and should be done after thoroughly reading AutoLight.reg.txt. - the horizontal blue line is the current backlight level (only available when AutoLight is running). If you are not satisfied with the backlight level as computed by AutoLight you can add a positive or negative offset to it. The offset values, one for use when on battery and one for use when on AC power, can be entered using the Configurator. Moreover, installation puts the small utility ChangeLight.exe together with AutoLight.exe. Running ChangeLight.exe with parameter "/-" decrements backlight level by one, with parameter "/+" increments backlight level by one. The utility then adjusts current offset level accordingly. Using ChangeLight.exe and a hardware button mapper you can change backlight and offset without using the stylus. Take control of Morty the Rat as he runs, jumps, climbs, and does a lot of damage in the down-town sewer districts, across thick jungles, through evil Cat Villages, many more locales, and help him get back his Cheese! 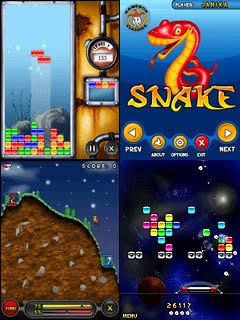 Gamebox Classics is a collection of six highly addictive puzzle games to keep your mind stimulated and your stylus tapping! Gamebox Classics features colorful graphics, tons of visual effects, over 20 minutes of music and a very smooth game play. All tailored for the Palm OS platform for the best experience possible. And most importantly, the games are fun to play! Join an amazingly fast paced journey to the ultimate source of wisdom. Follow the Eastern Dragon chasing a sacred Pearl of Potentiality. Share his supernatural power and excellence, goodness and fertility, vigilance and dignity. Get better and wiser as you twist and twirl through obstacles together. With a single flick of the stylus, you launch colored balls from the flying fan in the bottom of the screen. 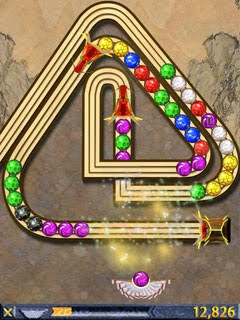 Chains of three or more balls of the same color pop to clear your way to the next level. Power-up spell balls cause explosions, slow-downs and reversal movement. Fruity fun for everyone! Use your fruit shooter to make combinations of 3 or more fruit and splat them off the board. The game has three play options: Fruit Falls - clear the board before the fruit fall down; Harvest Time - see if you can beat your time; and Citrus Twist - clear the board using as few fruit as possible! Fruity fun for everyone! Use your fruit shooter to make combinations of 3 or more fruit! 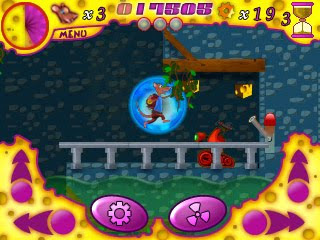 * Fruit Falls - clear the board before the fruit fall down! * Harvest Time - see if you can beat your time! * Citrus Twist - clear the board using as few fruit as possible! 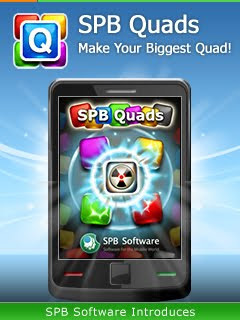 * Three game modes: Regular, Strategy and Speed provide for every taste in puzzle games! * Unlimited levels in each mode! * Nineteen bonus puzzle levels to tax your mind and increase your score! 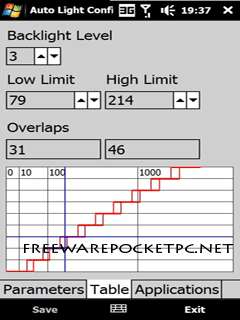 * Fantastic enhanced sounds for Pocket PC and appropriate Sony and Palm OS5 devices! * Choice between stylus / key control. * Interactive tutorial to start you off. * Built-in instructions and tips. 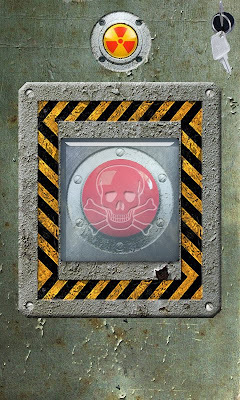 Flip Disc is an innovative game with a fine blend of puzzle and action elements. Rotate the five concentrical discs and take advantage of the special gems in order to form lines of gems of the same colour. Sounds easy? Every level the gems will be popping up faster and faster! Conquer the 10-levels journey and become a Flip Disc Master. 10 levels, each with its very own background music! 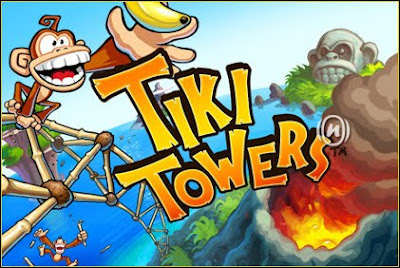 Simple, yet extremely addictive gameplay. Several types of colorful gems. Special bonus gems, such as the Joker gem, the Time Stopper gem and the Explosive Gem. Soft-buttons support and battery state indicator. 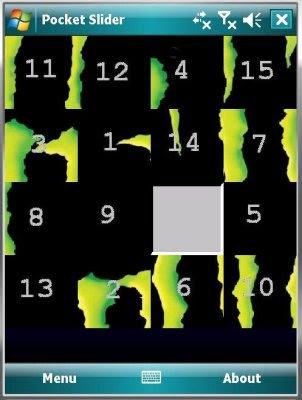 Slider puzzle for the Pocket PC. You can select a picture from your phone or take a picture from your camera on your phone. Also, if your phone has an accelerometer, you can shake your phone to scramble the picture. This is the first version and currently only supports screen resolutions of 240x320, 480x800, and 480x640. Next version, will have the square display to work next as well as adding some more visual effects.